Me and Bub were the test subjects. We both gave it a fair shake for two weeks. I saw no major difference in my skin and Bub's actually got worse around his nose and chin. 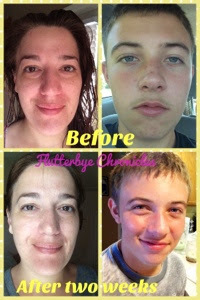 That was the end for Bub using it because being a teenager and dealing with crazy breakouts at the end of the school year was not cool so back to proactiv he went! 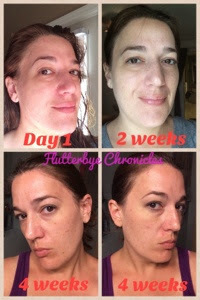 I on the other hand decided to give it another two weeks because I tend to think it takes about 4 weeks to really know if a skin care system really works. Well I still saw no difference and actually started to break out on my cheeks which is not normal for me. So in a nut shell this line did not work well with my skin but a lot of people swear by it so it might work for you. The first step which was the Pore Nourishing Cleanser to me left much to be desired. It just did not feel like it was cleaning my skin very well. Maybe I am just used to a more exfoliating cleanser. I did like the second step which was the Anti Redness Exfoliating Solution which contains 2% Salicyclic acid, but I think that is because it is identical in ingredients to the BHA liquid Paula's Choice sells which I absolutely love. The third step which was the Daily Skin Clearing Treatment with 2.5% Benzoyl Peroxide was kind of irritating to my skin which is weird cause proactiv has the same dosage in theirs and I don't have a problem?? I still think Paula's Choice has some awesome products like their BHA's so definitely check them out.